'D' Company, No 14 Platoon. Thailand-Singapore by aircraft, Singapore-Fremantle, HMT Highland Brigade. 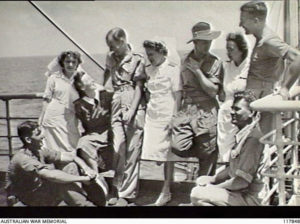 October 1945 journey home to Australian on deck of ‘MV Highland Brigade’ Left sitting: Alexander Smith and Wally Lynn last right standing with British Nursing Sisters of The Queen Alexandra Nursing Service and other 8th Division survivors. Wally was selected at Singapore to work on the Burma end of the Burma-Thai Railway. With ‘A’ Force Green Force No. 3 Battalion, Wally sailed from Singapore firstly to Victoria Point, in south west Burma. Please read further about this Force. There was a large number of 2/4th men in this work Force, at Victoria Point the men were divided into 2 work groups. One to remain working at the wharves and the other was sent to the airstrip to repair and enlarge. From Victoria Point Wally went to Tavoy where again they worked on an airstrip. From here they were sent to Moulmein for one night, and then to Thanbyuzat before heading to their first railway camp Kendau 4.8km, then Thetkaw 14 km, then was with advance party to Meiloe 75 km and Aunggaung 105 km. In December 1943 when the railway was completed, the POWs working in Burma were sent south to Thailand to one of four large camps, some were seriously ill and most in poor health. Wally was sent to Tamarkan then to Kanchaburi before being selected to work with the party sent to Phetburi and Kachu Mountain Camp from where he was rescued from at the end of the war. Wally passed away aged 76, March 10 2006, at Bullcreek, WA and was buried at Fremantle Cemetery.